SMALL KUCING: Restoran Ban Lee Siang, Malacca. You would have thought after that huge dinner at Umbai and the Putu Piring, we would have been satisfied and call it a night. Nope. We went cari makan some more. 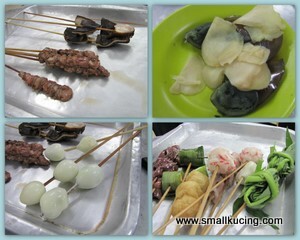 This round we go for Satay Celup(Steamboat Satay) . 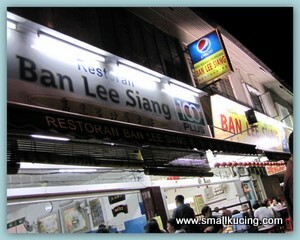 Papa drove us to Restaurant Ban Lee Siang. We have been to this restaurant before. Hmm....Mamarazzi kinda surprised to spot this notice pasted on the refrigerator. Both shops are next to each other. Wondering what had happen. Anyway, no eyes see la. I went to get the "satay" la. We didn't take much. Saja wanna lepas gian. The Satay is priced RM0-60 a stick. Not that pricey. Wah..they gave me such big SPOON ah? 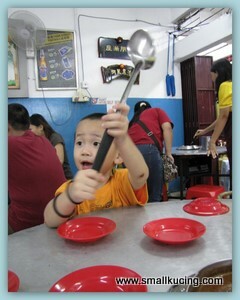 Mamarazzi told me it's use to stir the "steamboat" so that the gravy won't get burnt. One minute ah...I huff and I puff first. This is Mamarazzi's favourite. Yumm....the gravy still taste very good. Full of sesame seeds too. 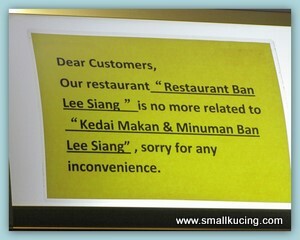 Here is the address : Restaurant Ban Lee Siang, 45E, Jln Ong Kim Wee, Melaka, GPG : 2.202742, 102.243994. Tel : 06-2841935. Opens daily from 5.30pm onwards. Can you guess where did we went next? Is the meat on stick called Gravy? It looks spicy and good to eat. 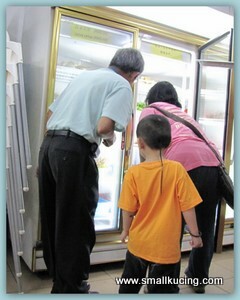 we have the same favorite mamarazzi,the food all looks tempted!! I prefer satay celup with plain boiling water - cook and then dip in satay sauce to eat. They do it that way in Singapore... Don't like the look of the boiling satay gravy....Eyewwww!!! the century eggs looks so yummy, drooling.. Happy thanksgiving to you too! Thanks for the comment on my blog! wahh..cari makan again? looks good.. satay steamboat.. i was wondering what it was initially.. hey, that reminds me.. i miss the Pan Heong koay teow wan tan la! A great one Satay celup.. Like much.. but long time no eat.. forget how was its taste.. I think i prefer eating normal satay with peanut gravy too but not satay celup :P Where next? Hmmm jonker street? Or Portuguese settlement? HEHE. wahh!! It really trigger me...my saliva 'ooze' out already..haha! ^^ I'll be going Melacca soon! yay!! Hi mama!! I find whenever I'm in Malaysia I am never "too full" to ever NOT cari makan, hahahaha. 24/7 can go cari makan one.. that's the beauty of Malaysia, hehe. I've never had satay celup before though... but aiyooohhh looks yummy!! And at RM0.60 per stick... Whoaa I just had dinner and now I'm hungry! The gravy for the satay looks thick and delicious. I normally try to have something similar from the steamboat van parked at the corners of any reoad. ish, ish, ish, ish, malam2 definitely cannot come here one, later sleep kan the tummy sure make out funny noises, protest cannot eat...wahahahaha.. tried this satay celup once but at seremban lah, taste ok.. but i still preferred luk-luk, dip with satay sauce..
it's one of the best satay celup restaurant at malacca :) a nice try! That little guy is just so cute. 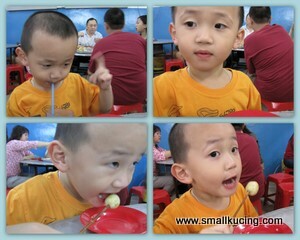 I don't know about the food, but he is adorable! Sigh, was in Melaka on Sunday but bad timing. Heavy rain & loads of cars meant we were stuck in a traffic jam for 2 hrs! In the end, just left without eating ANYthing!! wah, sob sob.